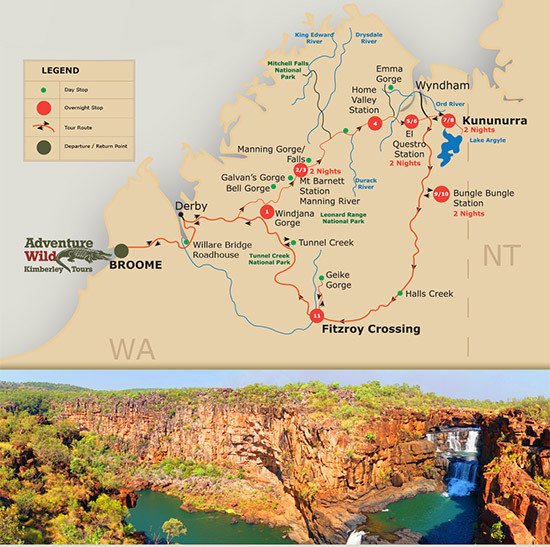 KIMBERLEY ADVENTURER SAFARI – 12 DAYS | Broome, Gibb River Road, Windjana Gorge, Tunnel Creek, Bell Gorge, Galvan's Gorge, Mt Barnett Station, Manning Gorge, Home Valley Station, Pentecost River, El Questro Station, Zebedee Springs, Emma Gorge, Pigeon Lookout, El Questro Gorge, Kununurra, Bungle Bungles, Halls Creek, Fitzroy Crossing, Geikie Gorge & Broome with an option to fly / drive /walk / helicopter flight to Mitchell Falls. Includes free Geike Gorge Cruise and Adventure Wild travel bag, water canteen & brand new sleeping bag for all guests. Escape winter, swim in crystal-clear rock pools, walk into spectacular gorges and be amazed by the stunning landscapes of the rugged and remote Kimberley region as you travel in safety, comfort and style. Adventure Wild has professional, experienced guides who will take you on an educational journey learning the history, culture, flora and fauna of Australia’s north-west. Offering small group tours, Adventure Wild is unique as the only company that has mature, married couples working together as guides on every tour. The personalised service and safety is second to none. With permanent campsites on 10/11 nights and four 2-night stays, Adventure Wild's relaxed itineraries ensure you make the most of your Kimberley adventure. Sit at a table to dine under a billion stars. Enjoy campfires every night and the best facilities available. Your final night is at an Adventure Wild exclusive campsite on the banks of a billabong. Travel in modern custom-built 4WD all-terrain coaches. Put your diet on hold as all meals are included, as well as all transfers, park entry fees, accommodation and guides. There are no hidden extras. There is also no single supplement and no requirement to share. BYO alcohol and soft drink and let Adventure Wild take care of the rest. From initial contact to post-tour communication, you will receive the best customer service. Adventure Wild will ensure that your Kimberley experience is an adventure of a lifetime. Two qualified, professional & experienced tour guides on every tour. Tour guides are mature married couples working together with a unique compatibility and teamwork. No single supplement fee. No requirement to share. Established campsites with flushing toilets & shower facilities. Relaxed itineraries to ensure maximum guest experience. Final night at an exclusive campsite on a working cattle station, literally camped by a billabong with a jetty for swimming access. All bedding provided, including swags with a comfortable mattress, sleeping bag, linen, pillow & pillowcase. Free Adventure Wild travel bag, water canteen & sleeping bag. Comfortable camp chairs with backrests. 240v system for charging camera batteries. Fantastic customer service and assistance from initial contact through to post-tour communciations. Deal directly and exclusively with the owners throughout your planning and preparation. Locally owned and operated from Broome. Adventure Wild Kimberley Tours have operated exclusively in the Kimberley region for the past 11 years presenting unique, focused and localised knowledge and experience. "Take nothing but photographs. Leave nothing but footprints"
Adventure Wild offers Eco-based Outback tours with sustainable, environmentally-friendly policies based on a love of nature and the great outdoors. An Outback Tour to The Bungle Bungles, Gibb River Road, Home Valley and El Questro Station is something that only happens once in a lifetime, so spoil yourself and join Adventure Wild on an experience that you will never forget. People who ordered Kimberley Tours also ordered the free travel brochures below. Click on the images to find out more about these brochures.